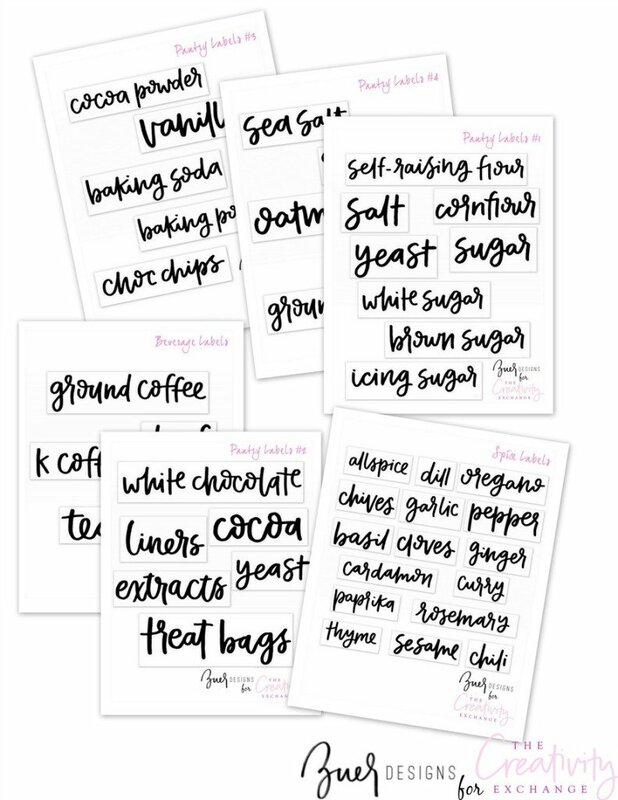 Last Friday, Jo from Zuer Designs was here sharing over 45 of these adorable free printable hand letter labels for organizing the whole pantry and/or a baking cabinet. By the way, if you want to edit and type in your own text for your labels, you can do that here. 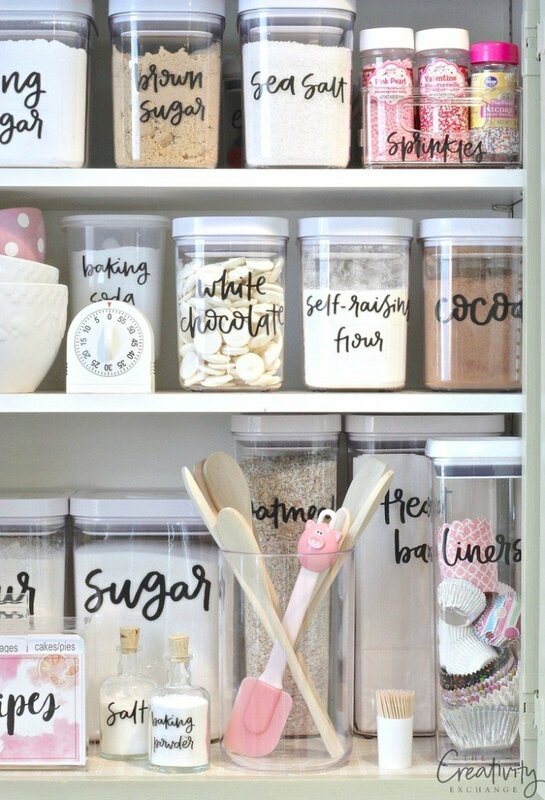 I used the labels for organizing my baking cabinet, which are the images we used in Jo’s post as an example of how these labels look in action. They are so fun! 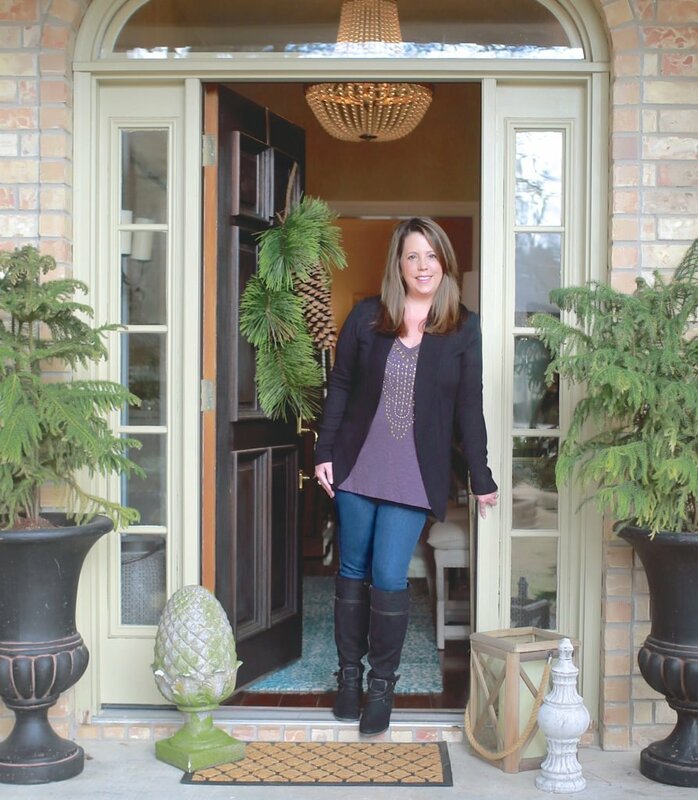 I mentioned that I would be back today to share all of the storage pieces, sources and a few tips to maximize space. I have a very small pantry area and years ago, I pulled out all of my baking supplies and dry goods to create a separate baking cabinet. Moving baking supplies into its own area is a fantastic solution for creating more room in your pantry-if your pantry is small like mine. I needed every square inch, so this has made a big impact! 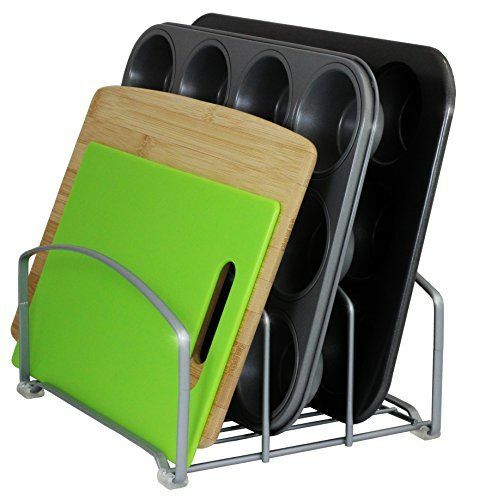 It also makes things extra handy when baking and cooking. 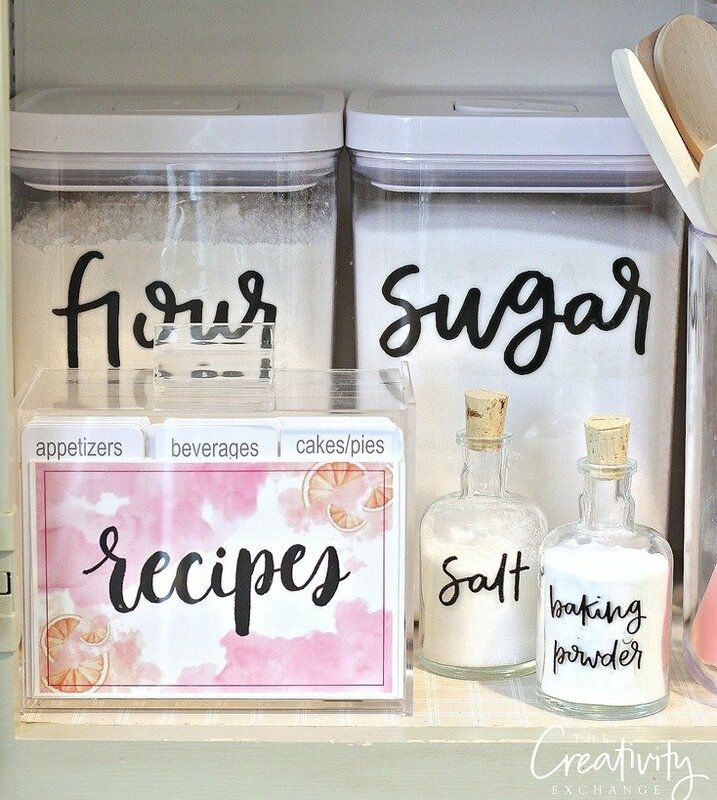 As a side note, #5 and #6 listed above are free printables (recipe cards and pantry labels) that are available for free on the blog. I’m linking to the posts below if you want to download those printables. 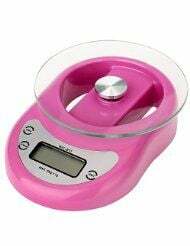 The rest of the items are all available on Amazon (Amazon affiliate links used). 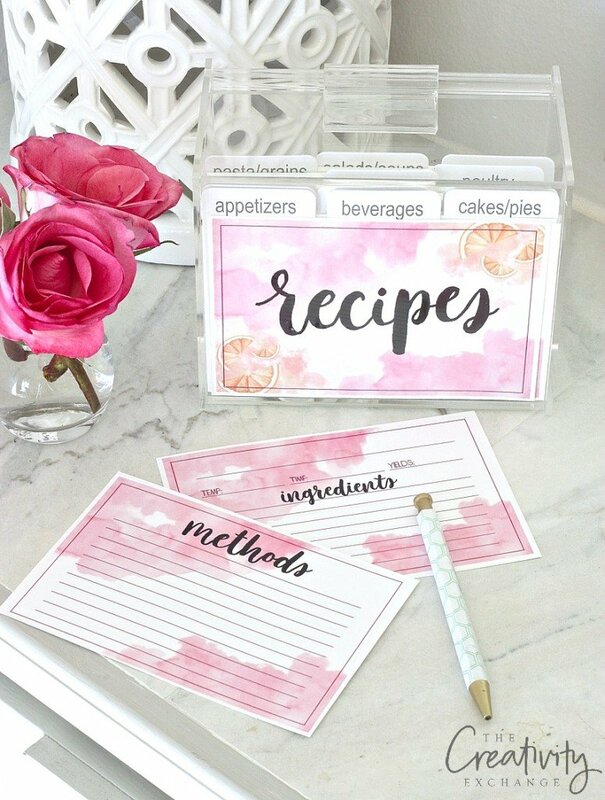 The clear lucite recipe box that I used for our free printable watercolor recipe cards can be found on Amazon here. 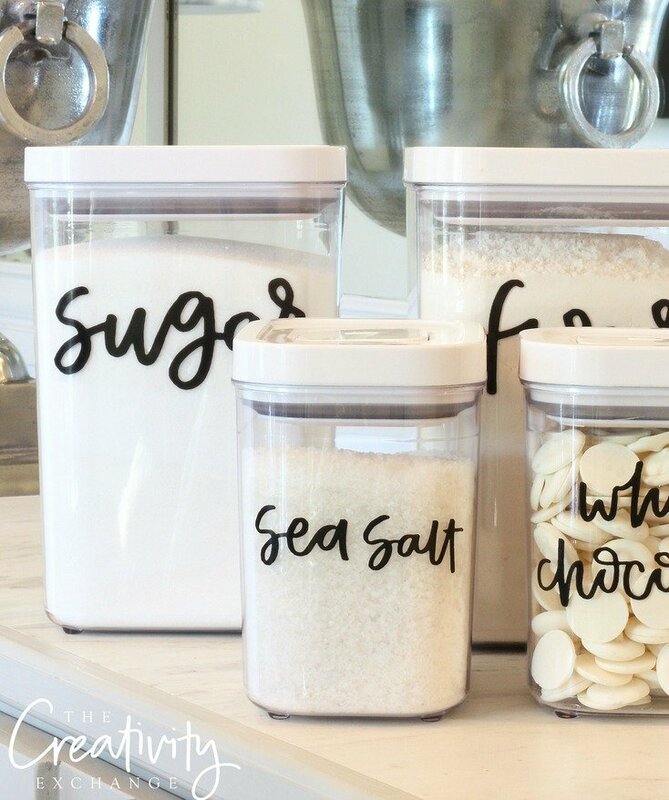 The free printable pantry labels can be found here. Here’s a snapshot of some of the labels. A more detailed list of all 45 labels are on the label post. You just use clear sticker label paper and cut. 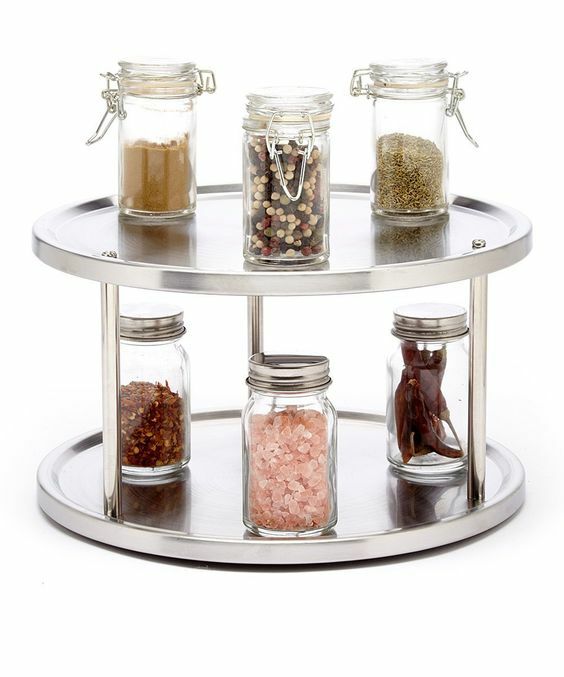 Also, a quick trick that I use throughout my kitchen top of the counter and in cabinets (and office for my paint brushes), is to use the round clear acrylic storage canisters (#12) without the lid as utensil holders. 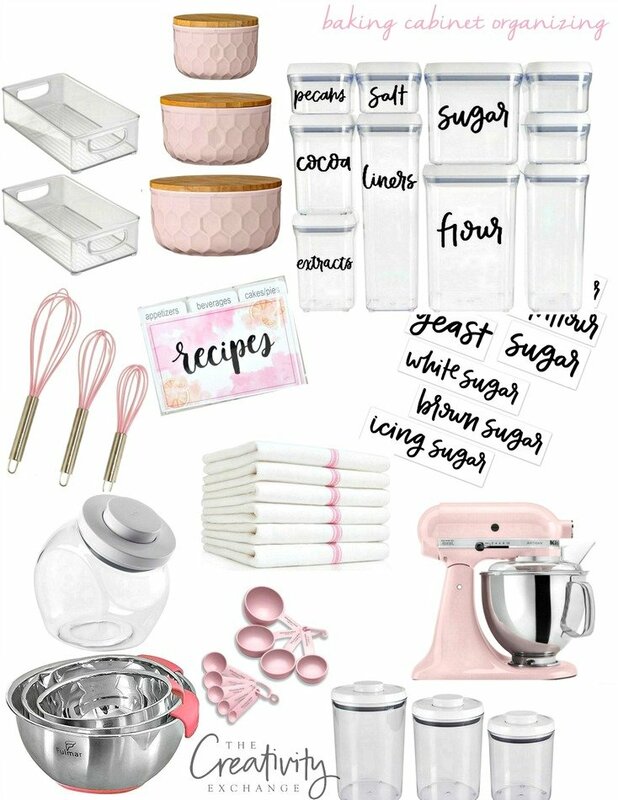 YouCopia Bake Stack organizer for sprinkles, frosting tips, extracts, etc… such a great piece for keeping up with all that little stuff! 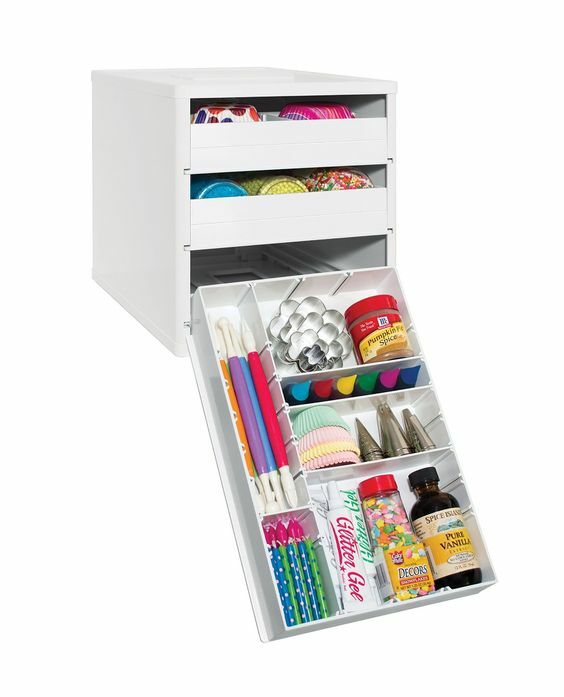 If you need to make more room in your pantry and baking cabinet will really help free up space. 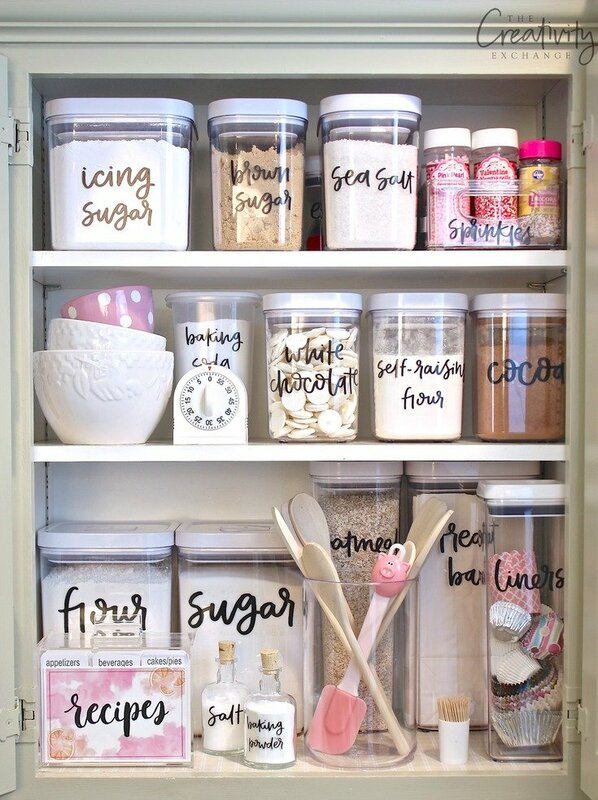 In the next couple weeks, I will be sharing more pantry and special cabinet organizing that I have done with Jo’s labels. 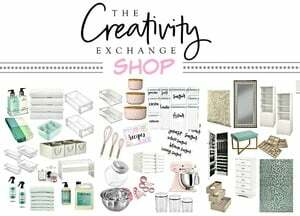 By the way, you can see more of my favorite storage containers, items to label and beautiful decor items to help you organize in my online shop here. Thanks so much for sharing all of these sources! 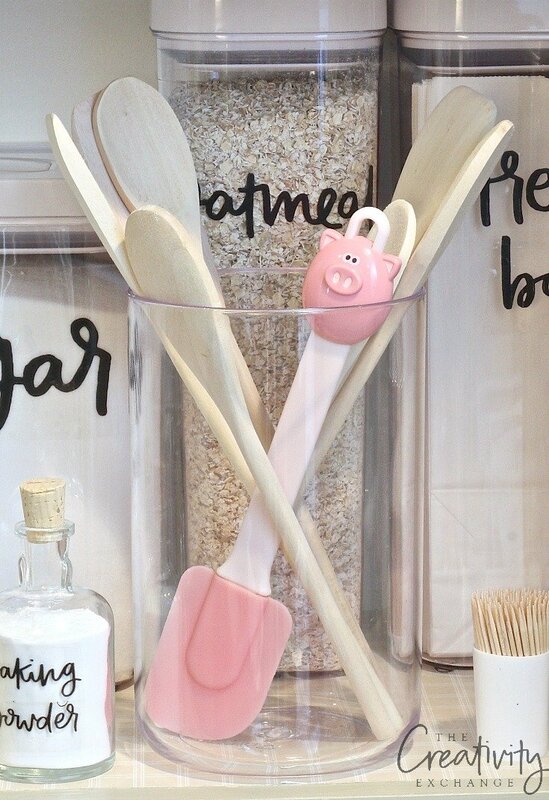 Do you happen to have a source for the adorable pig spatula? My daughter loves pigs and is really getting into baking and would love a pig spatula!!! Thanks! GREAT make over on baking cabinet! I love being organized with my baking! How wonderful you are showing your daughter ‘how it’s done’ and keeping her interests in mind with the pig spatula! How FUN! Came across your blog as I was looking for tags for my baking pantry. Thanks so much for sharing those and your storage as well. 🙂 Was wondering though where you got the container for the salt and baking powder? It’s really nice. Cute Idea… I would rather cut them out of vinyl…which font is this? Not sure if this was in your printing tips but didn’t see it. We had a vinyl graphics company and learned that if you very slightly round the corners they tend to peel off less easily. For some reason squared corners catch on things and mess up more easily. As these are clear stickers it won’t ruin the look of the printed label either. At one time you had a link to edit the labels but I don’t see that option anymore. Is that no longer an option? I made several for my pantry but one of the containers was damaged and I need to replace label.